Malaysian authors, edited by Zen Cho and published by Fixi. We are excited to be hosting the editor (with an introduction) and the authors here today to talk about the anthology. I’ve been following the fortunes of Malaysian indie press Fixi with interest since Amir Muhammad founded it in early 2011. There aren’t so many publication opportunities for Malaysian fiction writers – especially Malaysian Anglophone writers, and most of all Malaysian Anglophone writers of things other than controversial political jeremiads and literary World War II epics. Fixi has gone from strength to strength since then. Its books regularly block out the Malay and English bestseller lists at local bookstore chains. It’s translated into Malay literary megastars like Haruki Murakami, Stephen King, Neil Gaiman and John Green (Amir: “I just told their agents nobody else was going to ask for Malay rights”). Last year it won the Bookseller International Adult Trade Publisher Award at the London Book Fair. So when Amir asked me if I’d like to edit a cyberpunk anthology for Fixi – appropriately enough, when I was at WorldCon 2014 – I jumped at the chance. 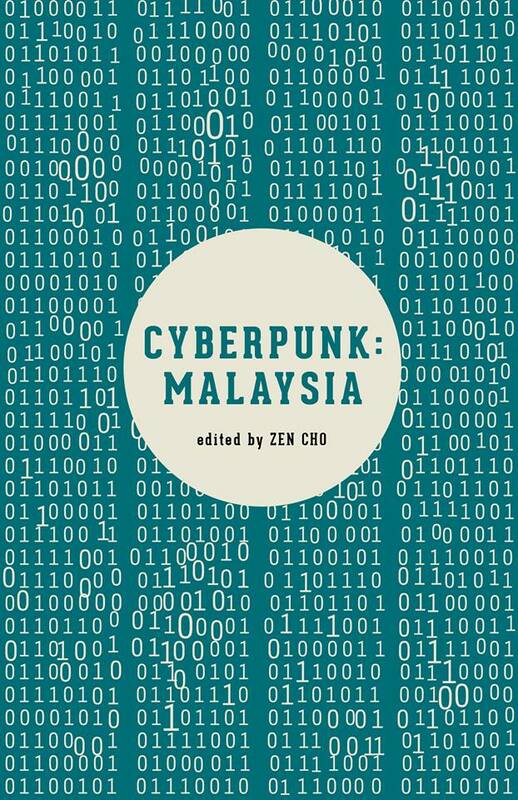 Amir says of the anthology: “I decided to do Cyberpunk: Malaysia because a reader emailed me to suggest it. He said it would fit the Fixi catalogue. It seemed like a fun idea even though our previous science fiction books flopped. But since ‘cyberpunk’ sounds sexier than ‘science fiction’, it may have a fighting chance. I asked the authors to tell me about their stories and what drew them to cyberpunk. Dian Yusoff, a guilt-ridden Atasan woman, died and was turned into the relentless robot MMU-Model DN-01152. Years later, her human memories surface, casting aside her robotic programming, and Dr. Dee, mobile medical cyborg, has to pick up where she left off, with the help of her mechanic and her troublesome nanocable hairdo. I like science fiction, and I like detective noir. As I get older, I find I keep reliving my childhood, which included the inevitable “imagine your city 100 years in the future” art project. We always drew shiny buildings and flying cars – utopia. We’ve done a flip now, and the future world is mostly dystopia. I guess I’m tired of that and would like to see a change. Even though Dian Yusoff’s world is in the dark underbelly of a shiny tower city, she’s still cautiously optimistic about things. Maybe that cautious optimism about our future is punking it. Nadia discovers a whole new world of knowledge when she is given access to the Internet via a fake ID – one that hasn’t been filtered and censored by the religious authorities. Whilst her cousin, Sheila, revels in the freedom to obtain items proscribed to those of the Muslim faith, Nadia has to decide which is more important to her – knowledge or faith. My colleagues talk a lot about the Internet of Things. I think they rubbed off a little on me. Also, I do read quite a bit of science fiction so I wanted to try my hand at writing it. Personal imagines a future Malaysia where devices have become the primary mode of communication, with stringent social etiquette surrounding it. The theft of a device then becomes the catalyst to examine these social mores. I’ve always been fascinated by sci-fi, but the cyberpunk subgenre brings an element of urbanness – technology, crime, a sense of isolation – that feels intrinsically familiar to the city-born-and-bred person I am. There is something oddly exhilarating in reading or writing about a world so flawed and yet so close to ours that it could well be us someday. When his wife becomes obsessed with stationery promotions, Jamal investigates, only to discover a horrifying conspiracy. Attack of the Spambots is an offbeat tale of what happens when good people become bad advertising. Modern technology and people behaving badly have one thing in common: they will only rise as we move into the future. And they’re always so much fun to read about! The Nusantara Caliphate is a theocracy made up of the former countries and states of Malaysia, Thailand, Vietnam, Cambodia, the Indonesian Archipelago, the Southern Philippines, Papua New Guinea and Australia, united by the 2025 Great Purification. This paper by the Nusantara Caliphate University of Science and Faith details the origins of the Machine, a critical piece of governance technology implemented successfully by the Caliphate to eliminate religio-crimes and deviance. Since the implementation of the Machine, the cost of religio-crime enforcement, incarceration, deviant reeducation and execution has reduced by 65%. This paper also describes the way forward and future plans for fetal Machine deployment. PDP-11s, VAX, UNIX, IBM XTs, DOS, the BITNet and the Ramones bring me much enjoyment. Andromaids are now the most popular kind of labour available for housekeeping duties. But when their artificial intelligence goes beyond their cleaning duties and they start reading prohibited texts, they bring down the wrath of the authorities on their families. Cyberpunk is a genre I’ve adored ever since I watched Blade Runner. A genre where the neon contrasts with the grittiness of a noiresque world filled with robots and flying cars, as well as lone hackers with electronic implants hiding around dark corners jacking into a global computer network, makes for a wonderful sandbox to play in. KAKAK deals with the misadventures of a runaway robot domestic servant struggling to find a better life despite the knowledge that she has no future in the human world. Along the way she falls in with the kindly Mas, a broken-down android NGO representative who dreams of a better future for their kind. The issue of domestic servant abuse is particularly rampant in East and Southeast Asia, and when this anthology was announced, I decided that science fiction would prove to be a good avenue for discussing it in fiction. The funny thing that I noticed is that oftentimes, they are often perceived as being more like part of the landscape and furnishings than actual living individuals, and by casting androids as maids or faceless brute labour in this story, I hope to be able to highlight their anonymity by giving them human tics and emotions. Hopefully I managed to achieve this with KAKAK. A plasma wall has replaced the border between Malaysia and Thailand. For some, it offers security; for others, it’s a cage. One woman is tired of living like an animal. I have always been interested in the concept of steampunk but can’t write it for crap. When I saw the call for this cyberpunk anthology, I thought it would be interesting. While I initially dismissed the idea of even submitting a story, I couldn’t help but keep thinking about how I would approach Malaysia through the lens of cyberpunk. October 11 is set in 22nd century Kuala Lumpur where Shen, an exiled government official in the Siber Tadbir (cyber administration), finds himself with most of his memories erased for a criminal offence. With help, he manages to remember that he has to stop a government-ordered mass murder of his village, Bukit Rimba. Will he manage to reach the Siber Tadbir HQ before October 11 and successfully abort the order to rationalize his village? I could not resist the challenge of writing a cyberpunk story as I had not written one before. As I was doing research for this piece, I discovered an exciting new world of storytelling. I love how science fiction can also be used to convey truths in a fun and cool way. A policeman in post-revolutionary Kuala Lumpur re-examines his values and beliefs upon being assigned an undercover mission to infiltrate a rebel group. Cyberpunk presents the ultimate opportunity for me as a writer to examine humanity in a technological scenario of the not-so-distant future. GARRET BRYNN is back, now on DALVIK-TELLUS’s payroll, to find out why their KOLUMPO operations were brought to their knees! Is it SABOTAGE? Does it have something to do with atrocities committed to achieve the HOLY GRAIL of HUMAN UPLOADING? I like cyberpunk as a genre. It reflects our anxieties, can be used to comment on the grim meathook future that we’re hurtling inexorably towards. Plus, the genre’s subversive, but I always felt like it was never subversive enough. I thoroughly enjoyed Neal Stephenson’s The Diamond Age’s deliberate subversion of The Typical Cyberpunk Badass (i.e. Bud), but I wanted to do it to a Henry Case-type character. Aaand I’ve probably spoiled the story for everyone. Oh, well. That’s okay! Come and see how he gets his comeuppance! A graffiti artist paints an irreverent image of Malaysia’s most beloved Prime Minister, and is executed – at the two-dimensional hands of his own mural. The stories I consumed growing up of ingenious (and angst-ridden) resistance against dystopia – they seem antiquated nowadays. Here in Malaysia Facebook rules all, and I don’t know any phreakers. Now the punks are creative directors; their rebellions are brands. A kind of capitulation. “The White Mask” is about that, I think. Its characters compromised. Working within the System – if not for it – they grew wealthy; they secured for themselves measures of empowerment. Then things change. The Man and His Money, fickle, hang them out to dry. They were never really free to begin with. Cyberpunk, I guess, because angst, ingenuity, and resistance are right things, against a civilisation of capitalism, social conservatism, and co-opted anarchy – our dystopia today. 10 years after a civil war ravaged Kuala Lumpur into DMZ (Dataran Merdeka Z), people are easing into a post-war life. DMZine, a zine published inexplicably on paper, is their hottest entertainment. Extracts from DMZine #13 (Jan 2115) is a series of articles from this imaginary zine, with a vague hint of a revolution rocking an already fragile balance. There’s even a Burmese salad recipe if you hate fiction! A lot of authors – Bruce Sterling, in particular – have declared cyberpunk dead. But that’s not necessarily true. Cyberpunk is a futuristic genre, its core themes being revolution, identity crises, Asian exoticism and technology-humanity disconnect. It’s remarkably relevant when placed in parallel with present-day Malaysia, a country already teetering on the brink of irreversible change what with its political, religious, interracial and economic climate. Also my current favourite music is retrowave right now (try driving with the Hotline Miami soundtracks on) and cyberpunk is a lot less stupid than steampunk. Outside Malaysia, Cyberpunk: Malaysia is available in print on Amazon.com and as an ebook on Smashwords and Google Play. We are giving away one copy of the anthology to one lucky winner. The giveaway is open to all and will run till July 11 11:59AM EST. To enter, use the form below. Good luck! Thanks for holding this giveaway and published this post on Malaysian authors! I haven’t read much cyberpunk, but it’s a genre I’d like to explore, and this looks like a good place to start. Thanks for the giveaway! This looks very varied and a good introduction to the area. So excited to see this post! I’ve been hunting for Sci Fi with non-Western narratives, and this perfectly fits the bill. I don’t think I have read any Malaysian author, it seems interesting to give a try. Thanks for this giveaway.